As a kid at school a Welsh music teacher told me that a good story was like a fish, with a distinct head, middle and tail. At the time I thought it was clear that he had never seen an eel, but in a rare moment of student restraint I said nothing. Like many other teachers of his generation, he mistook his ability to declaim without challenge for an access to the truth. And for all that the prophets of Post-Modernism would have fainted at such a simple notion of narrative, the vision of that idea has stuck with me. The idea of the story as a fish is too simple to apply widely, but if ever there was a single place that held the head, body and tail of my story it is the Lake District – The Lakes – in the north western corner of England, just below Scotland. But even then it’s not that simple. Some of my stories came to an end in the Lakes, some began and some found the full expression of the middle. I first arrived in The Lakes to participate in a Leadership Course – the full spectrum of butcher’s paper brainstorm sessions, introspection and outdoor activity. During those two weeks the Wall in Berlin fell, but no one felt the need to tell us. It was that kind of time: focused on an inward path that would lead to an outward expression. The course was supposed to send me back to my community empowered as a leader of some sort, but what it did do was convince me I had to leave it. (A fish tail if ever there was one). I returned to The Lakes ready to wash dishes and clean carpets for a couple of months before starting to work as a Volunteer Instructor. I expected to be there for six months. I left four years later. When I arrived I had all my worldly goods in a couple of bags and one box. I left with a clutch of qualifications that surprised me as much as they would have surprised my generally critical PE teachers. I also left in the company of the person who is now my wife. To this day I still don’t really know how I managed to do either. I walked, climbed, scrambled and even paddled a little. I met kids from all over the UK and showed them some of the landscape that had inspired poet, artist and tourist brochures; some of them may have even looked at what I was talking about or listened to what I was saying. Some. Now it was time to show my own kids. We arrived in the Lakes on a road that runs under the slopes of Blencathra, a many-headed hill that sits on the northern edge of the Lakes. The small roads and lanes that run away from the main roads are lined with brambles and old stone walls. On one afternoon, many years ago, we collected blackberries and stashed them in our lunch boxes – later they were converted into a crumble that has gained near mythic flavour. Just visible was Sharp Edge, an angular ridge that runs upward towards the rounded top of the hill. In both summer and winter it’s a good way to gain height, but today we are looking elsewhere. The story of the great blackberry collection walk has been told before, but once more I find myself telling the story, this time to the kids in the back of the car. It’s a story that has so many strands, food and company not the least. It’s a story that because of its very essence is about home and place – the provision of food, the finding of comfort. It’s a story that, like the blackberries, is rooted into a single place and makes no sense elsewhere. But the meaning it brings is independent of the landscape that made it. If, through a slip of fate, the story is lost and forgotten, the landscape will remain the same, unchanged by the passing of a story which it helped shape. We add meaning to landscape, but the landscape remains unchanged. This is not just some modern, worship of the individual situation, but an age-old issue. Not that long ago fells like Blencathra and rocky ridges like Sharp Edge would have been seen as bleak and inhospitable and the prospect of walking on them for recreation, strange. But our view of the world has changed, and once where there was emptiness and chill we now find the tonic of wildness and isolation. But the bones of the landscape have not changed. Below the hump-backed fells lies an even older example of our need to bring understanding into the landscape. Over 5000 years ago people discovered something in the landscape here that they found valuable, and within sight of some of the highest peaks in the Lakes they built what is now called Castlerigg Stone Circle. We don’t know what its purpose was, but it is beyond coincidence that a work of such effort would be placed without thought or care. People from that distant age were not brute savages with perpetually grazed knuckles, but modern humans just like us. We spend hours discussing the placement of glasses on tables and statues in gardens; why would the builders of Castlerigg been any less careful? 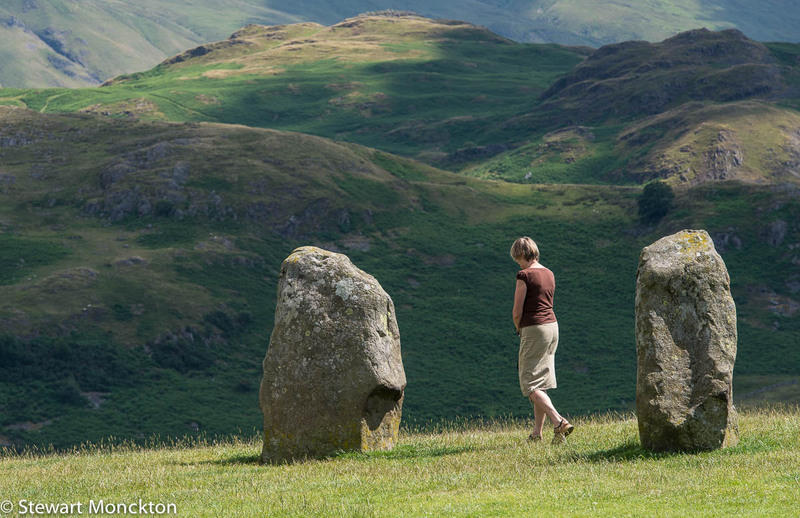 There is a freedom to be had in a visit to Castlerigg. The rituals and ceremonies that occurred there have been lost, but it was clearly a place to visit; a place where people – or their leaders at least – came together. And today you can stand within, next to and even on the stones dependant on mood and your respect for regulation. This is not like Stonehenge where you can only stand outside to look in and take it on faith – possibly an appropriate reaction at such sites – that the stones have not be stolen away in the night and replaced by concrete and fibreglass replicas. The stones at Castlerigg do not sing at dawn. You cannot strike your fist on the hard slate surfaces to summon a wizard back from his battles with the dragon. The Druidic rituals of pop culture are an invention of a romantic age far more modern than the stones themselves. But for all that, the stones have a simple and magnificent presence. When you lay a hand upon them it’s the closest you can get to time travel. You cannot help but think ‘why?’ The organisation and effort needed to drag these stones into this formation would defeat most well fed modern communities, but 5000 years ago people thought it was worthwhile. People eat their lunch, backs rested on the cool stone. A man and woman, with separate paint boxes but shared water, paint watercolour landscapes. I can smell coffee being poured from a flask. People are still drawn to the flat field and its stones in the shadows of the high fells. Effort. Meaning. Landscape. Place and space. Fish heads, fish tails and fish middles are rolled into one and blended into stories that people will take away and spread. The stones stand still, but the meaning they help people make spreads like ripples on a pond. Back in the lane where we left the car an ice-cream van has parked, and people fret over the cost of a 99 and suggest that the flakes are not the best quality. A meadow-brown butterfly works its unsteady way along the hedgerow. Somewhere in the distance a cuckoo calls a few times and then falls silent. There are many things more precious than ice-cream, but not everybody seems to notice. We head south down one of the valleys that radiate out from the central core of the lakes. Think of pinching a ball of putty with the fingers, so that a cone forms in the enclosed scape between the digits. The shape the putty takes will be a model of the Lakes – a central high area, with valleys spread around the edge. First carved by rivers and then enlarged by glaciers, there are almost as many long valleys in the Lakes as there are numbers on a clock. And each valley holds one or more bodies of water. I use the term ‘bodies of water’ because only one of them is called a lake – the rest are meres, waters and tarns. This is like a private joke that The Lakes only contains one lake. Memory is such a strange thing; even though I never lived in the Northern Lakes they seemed so familiar. Road signs and junctions appeared just as expected, single trees by the side of the road, which I had never photographed, but always noticed, were still there. The place was strangely unchanged in many ways. After the expanse of Australian roads I had expected the Lakeland ones to push in at the edges, especially where they were flanked by snaggle-toothed drystone walls. This proved not to be the case. I still caught up with (other) tourists who, intimidated by the imminent demise of their cars’ paintwork, decide to drive along the middle of the road, rather than keeping to the left. My old frustration with caravans resurfaced. If my memory of the Northern Lakes was remarkable for its clarity, my memory of the ground closer to the place I called home was notable for its ambiguity. I could not identify the corner in Hawkshead where Battersby’s Garage used to be and I had swapped the locations of two of the village pubs. The clash between the certainty of my memory and the evidence of my own eyes was off-putting. If the Kings Arms and the Queens Head can merge in memory to become one misplaced entity, what other of my memories were false or constructed? The south Lakes are almost the picture perfect English countryside; woods, small hidden ponds with rushy edges and the look of fish, wooden way-marked paths that criss-cross the fields. In the distance you can see higher hills, maybe mountains in the imagination, and certainly so in the winter. You can choose your own adventure. You are never that far from a pub or a café, which you can use as a goal in themselves, or as a reward at the end of a longer day. For the best part of five years I called this part of the world home, and even now, twenty years later, it would be an unusual week for me not to think of it. We collected the keys to our rented house and drove away from Hawkshead. Once we were back on the narrow roads my memory recovered – the kink in the road where the last house on the way north pushes out into the road, the old Courthouse by the bridge where we turned left up the hill. If we drove too far we would start to drop down towards Coniston, with its history and speeding ghosts. However, we had detailed directions, which ended with ‘and then turn right down the rough track marked by the blue wheelie bin and the triangular back of a road sign’. What this lacked in formality it made up for in accuracy. Passing through two gates, both held in place by improvised latches of string and wire, we arrived at the house. Built from rough-cut slate blocks the house was in fact an old water mill. Build in a formidable L shape the heel of the house was set deep into the ground, so that all you could see from the track was the roof and the upper floor room. In its entirety the mill stepped down through six floors, all but one of which was a single room. A staircase, creaking wood in its upper sections and foot chilling stone in its lower, spiralled down through the building. It smelt of the woodland that surrounded it. With the windows open, it rang to the sound of the stream that flowed past the toe of the L, over a long unmoving water wheel. Bird feeders hung outside the windows and I could hear Wood Pigeons in the trees. In the kitchen the water ran fridge cold from the tap, and the cistern in the toilet filled at an unmodern and leisurely rate. Although it was summer, the grate was still full of recent ashes from a coal fire. If a small black cat, with an under-chin white spot, had walked into one of the rooms I would have not been surprised as this building was hauntingly similar to the house I was born and brought up in. But just to prove that progress was possible this one had running hot water and a working stove. The longer I stayed there the greater the sense of familiarity became; the uneven stone floor under foot, the way the lock on the back door clicked twice as you unlocked it. The cat never appeared, but behind the mill we found evidence of other black and white residents. The flat stone bridge over the stream had one section that rocked with a hollow tic-toc that marked your passing. Oak trees shaded a vague path and hazels, already robbed of nuts, hung their soft round leaves at head height. The path skirted a small, steep sided valley so that the ground dropped away steeply on the right and rose up to a fence line on the left. This was classically English habitat; damp, green, soft, small. And pouring down from the fence line, in fan shaped sweeps, was the evidence that we shared these woodlands with badgers. There were half a dozen fans of excavated soil below the fence line, and moving away from them in many directions were paths of flattened plants. The bottom wires of the fence line held clumps of stiff hair, and one of the flattened paths carried on out into the uncut summer meadow beyond. I liberated a few handfuls of peanuts from the bird feeders and scattered them near the entrances to the sett. Peanuts are essentially Badger crack – a combination of tastes and textures that they find irresistible. We left the peanuts to do their addictive best. The next morning they were gone; not a single one remained in sight. The piles were replenished in anticipation of the coming evening. At just past dusk we walked out over the flat-slab stone bridge that spanned the stream behind the mill. The noise of the water, increased by overnight rain, covered the tic-toc of the wobbling slab. The sett itself was just over a slight rise, maybe some form of mill archaeology long buried in leaf litter. Whatever its origin the rise and the voice of the river allowed us to walk to within a few meters of the setts unseen and unheard. I had briefed the kids on the need for silence – a fool’s errand if ever there was one – and to my surprise it seemed to be working. We moved forward a feather step at a time until we could see into the mouth of the nearest hole. And there was our target, in one of the entrances to the sett hidden below a hazel thicket – just a black and white shape really – busily hoovering up my offering of peanuts. It was hard not to laugh; you could hear all kinds of munching and slorphing noises emerging from the gloom. This was more a proof of concept sighting than real badger watching, but it set us up for the nights that followed. There was something undoubtedly magical about having badgers just over the stream. Of course our presence made little different to the badgers (peanuts excepted), who, from the size of the sett, had probably been there for many years. But it made this a special place for me; a place that was so rooted in classic Englishness that it bordered on caricature but for all that it was real. I took a small piece of woodland and let it become all the things I missed in my new home. It became a distillation of the things I thought I would do, before my journey took an unexpected turn and I headed south. Of course it was none of the things I made it. It was just a small patch of Cumbria, as distinct and different as it was homely and reassuring. But for one week, for me, it became so much more. A few evenings later we were all sat around the base of an oak tree in the gathering darkness of the evening. The midges, tiny biting flies which are surely the product of the dark side of evolution, were mercifully scarce and the mosquitoes largely absent. We could hear a badger eating its fix of peanuts, but all we could see was a lumpy form in the deep shadow of the sett entrance. The badger, presumably having finished its peanut starter dish, emerged from the shadows and trotted stiff legged up the slope, away from us and towards the fence line. I assumed it would disappear into the meadow beyond, but the crashing and rustling up by the fence suggested otherwise. At this point it became clear that badgers do not have a stealth mode. The badger was uphill from us and this meant that every so often a face would appear silhouetted against the relative lightness of the sky. A triangular face with rounded teddy bear ears would look down the slope in our direction. I’m sure that the badger knew we were there, somewhere, but it was unable to determine where. It turned its head so that its long snout pointed off to the left – a perfect silhouette of the long angular face. You could just make out the pale markings. There was more crashing from above us and I am convinced that there was more than one animal up there – maybe young ones, clumsy at the world’s novelty. The woodland falls quiet, save for the whispered reports of bats from my children. The rocky stone bridge welcomes us back home. A Tawny Owl kricks from somewhere further down the valley. The back door clicks shut. I pour a beer. Out in the woodlands the badgers go about their night-time chores. Early morning sunlight filters through the trees that shade the mill. Motes of dust. Light beams. The cool of a summer morning moves through the open window and promises clear skies and light winds. I listen to the woodland awake as my family lies asleep. Behind the village of Coniston a steep road runs up and away from the valley floor with its stone edged fields and solid slate built houses. It’s a road to traumatise drivers used to freeways and city slopes. The very top of the steepest part is marked by a sharp left hand corner, followed by a right. The very end of the road is marked by a gate – The Fell Gate – that separates the enclosed lowlands fields from the open fell beyond. The Gate and the wall it passes through are a clear boundary between two different, but linked worlds. But it is also a meeting place where things long disconnected come together and reconnect. Uplands and lowlands. Summer pasture and winter shelter. And it is a place where you can arrange to meet friends with the certainty that everybody knows the place you mean. With the exception of a few of the kids we had all done this walk before, in winter, in summer, rain and sunshine, in company and on our own; sometimes carrying ropes accompanied by the tambourine rattle of climbing gear, sometimes carrying little more than a flask of coffee and pack of Eccles Cakes (Made with Real Butter). On this day some people brought children and some brought dogs, some brought both. Some brought cameras and walking poles. Everybody brought chocolate. Everybody brought memories. The walk was probably incidental, just an excuse for slow moving conversations and selective catching up – nobody needs to hear the bad stuff. We walk along the Walna Scar Road, once a thoroughfare between valleys, but now more trod for pleasure than commerce. I pass the spot where I first met Nick, who in later years would come to Australia to be at my wedding; the start of a story to say the least. 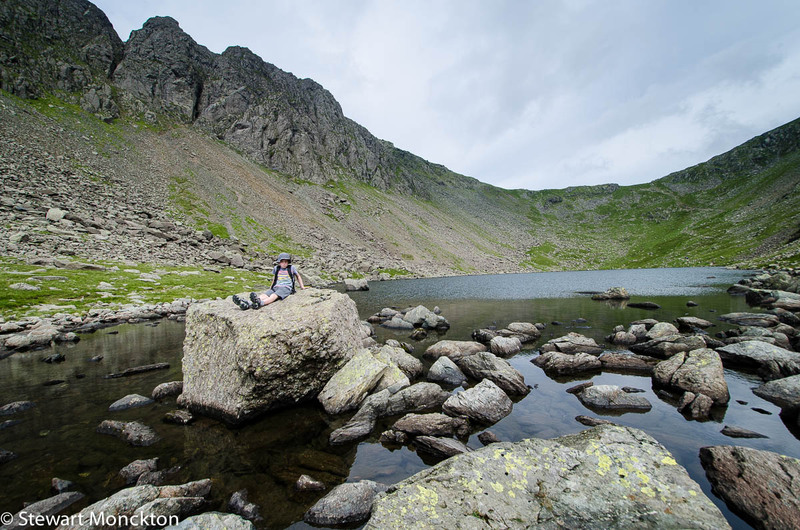 We turn right, uphill, towards Goats Water and Dow Crag where we stop for the ritual of morning tea. Rock chairs or beds are chosen as suits the individual. Beyond the water the path rises steeply and I stop to take pictures and catch my breath. At the summit – The Old Man of Coniston – the jokes are predictable and well known. The land falls away in all directions. Memories rise from all directions. The walk back to the car is too short for all the conversations that come to mind. The Old Man was the first hill in The Lakes I know I climbed. For a while it will also be the last. It looks like an extremely beautiful place! Beautiful scenery. I enjoyed your story and I can see that that early trip to England has shaped the rest of your life. You served up a treat full of memories, family, home, love. I had never heard of the fish analogy. Like you, I sometimes start in the middle of a story, or a journey. Chance encounters have played an extremely important role in my life story. I am not a good writer, but i always appreciate someone who is! Previously i thought Stonehenge is the only one of its kind in that part of the world, until a friend gave me a book about Scotland because she knows it is a country always in my dream; and probably will just stay as a dream. I realized there are many "stonehenge" there or the rock formations. They are still enigma, and thanks for letting us see some of the nearby landscapes. I am visualizing the fish throughout the post, and i smiled at your mention of the eel. Reminds me of the John Denver park in Aspen, only those rocks were put there and recently! I'm going to put this place on my bucket list. At least, maybe my son, who goes to woodfiring conferences in Australia can check it out.